Omis Riviera is my favourite place in Croatia. 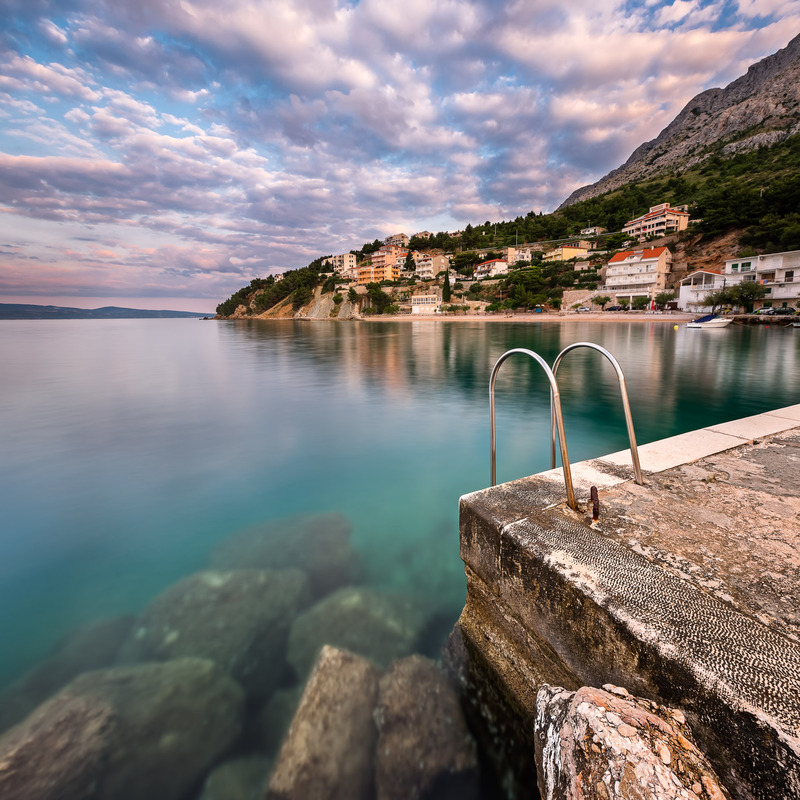 Located in the heart of Dalmatia it stretches for twenty kilometres along a coast of exceptional beauty, with many perfect beaches, small bays, steep cliffs and crystal clean Adriatic Sea. June 2014, panorama from 2 horizontal images, additional exposures for highlights, focal length 16mm, aperture f/11, shutter speed 8 seconds, ISO 100, 5-stop ND filter, tripod. This area has been famous through the centuries, with the first traces dating back to the pre-historic age and of course to the Roman Empire. The stone fragments of Roman inscriptions are among the most important vestiges which can be seen today, carved during the sovereignty of Tiberius, Emperor of Rome, around 30 A.D. The name “Omis” derives from the Illyric name “Oneon” from the Illyrian tribes of the Antiquity. This meant “little hill” and echoes to the mountain landscape and amazing canyon of river Cetina still in place today in Omis. Dalmatia in fact, was part of the Illyrian kingdom, till the Roman Republic established a protectorate on the land. On this early June morning, following the beach shore after my first sunrise shot from the previous post, I quickly reached the stone jetty, where the fishermen of modern times enjoy docking their boats, and swimmers can also relax during the hot day. The waters of the Adriatic Sea were so invitingly clean and crystal clear on this early morning, with their underwater shapes and huge rocks visible as if I was already inside the sea. The whole scene looked very peaceful and serene and I wanted to reflect as much as possible this amazing feel in my photo.